Iowa's Sen. Ernst Grabs Spotlight That's Often Proven Too Hot : It's All Politics As often as not, the opportunity to speak right after the president has been the kiss of death for aspiring politicians — especially for the GOP during the Obama years. 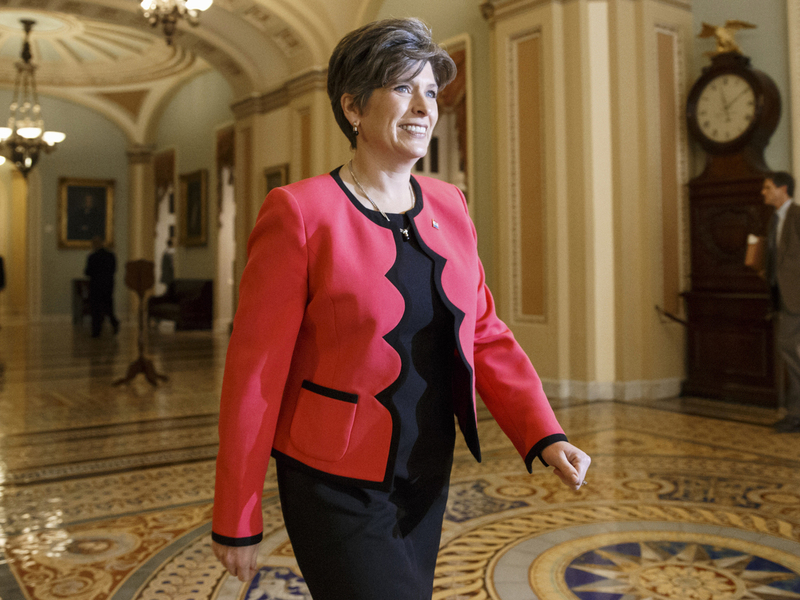 Sen. Joni Ernst, R-Iowa, will deliver the GOP response to the president's State of the Union address on Tuesday, January 20. On the one hand, having the just-elected senator from Iowa, Joni Ernst, deliver the Republican response to President Obama's State of the Union address next week makes perfect sense. On the other hand, you have to wonder why anyone would want the job. As often as not, the opportunity to speak right after the president does has been the kiss of death for aspiring politicians — especially in the GOP during the Obama years. But let's start with the positives. As Senate Majority Leader Mitch McConnell put it, the newly sworn-in Ernst is "the perfect choice" to address the nation on behalf of her party. She is a woman from a swing state that matters in presidential politics, a new face in the new Senate majority. She is also the first woman to represent Iowa in Congress for either party, the daughter of an Iowa farm family and a former colonel in the Iowa National Guard who served in Iraq. In November she won easily, rising from the state legislature to the seat that Democrat Tom Harkin had held for 30 years. 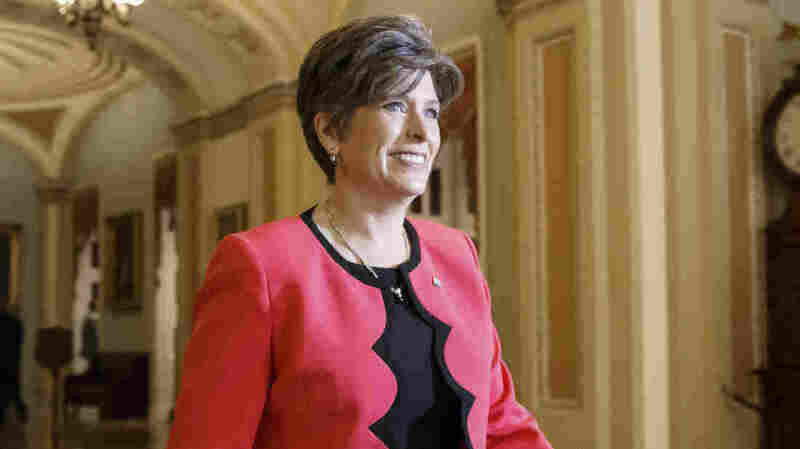 Ernst was a long shot a year ago, stuck in the pack of other Republican wannabes. Then she aired a TV ad in which she smilingly talked about castrating hogs in her early days on the farm. In case you missed the portent, in the ad Ernst said she'd know how to "cut pork" in Washington and "make 'em squeal." Soon the Ernst campaign was the talk of Iowa and the national political class that keeps a weather eye on the Hawkeye State. Late in the season, Ernst had some rough weeks and ran afoul of some in the Iowa media. In the closing weeks, she skipped editorial board meetings, even at the state's powerful Des Moines Register. She often sails past reporters now in the Capitol, smiling but answering no queries. Even this week, at the Republican retreat in Hershey, Pa., where her SOTU role was announced, she did not take questions at a press conference. No matter. The SOTU speaker is expected to give a prepared rebuttal to the president, and not to take questions before, during or after. It is an ideal role for anyone trying to elevate his or her profile in national politics. Except that, well, sometimes it doesn't work out so well, especially for the GOP. In the years Bill Clinton was president, a total of eight different Republicans took up the cudgels post-SOTU. Sen. Bob Dole of Kansas did it twice en route to challenging Clinton's re-election in 1996 (a challenge that ended Dole's career). New Jersey Gov. Christine Todd Whitman, U.S. Sens. Trent Lott of Mississippi, Susan Collins of Maine and William Frist of Tennessee all took their turns at the task. So did House members Jennifer Dunn, R-Wash., and Steve Largent, R-Okla. Of this group, only Collins remains in politics. Lott left the Senate late in 2007, by which time the other six were already out of office. Louisiana Gov. 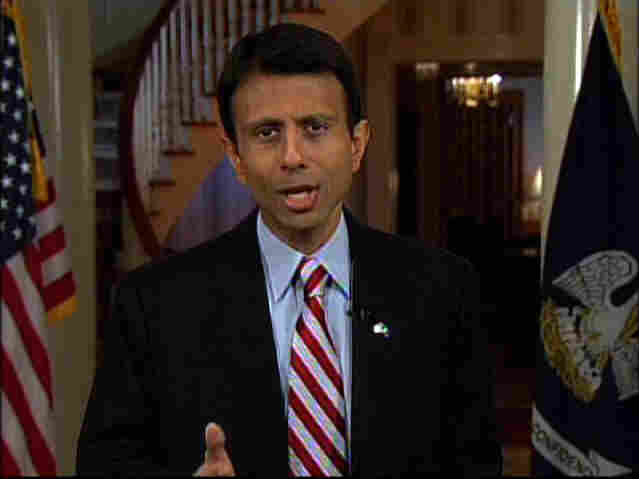 Bobby Jindal delivered the GOP response in 2009 from the governor's mansion in Baton Rouge, La. The Republican Party's luck has scarcely been much better in the Obama years. The first Republican anointed to respond to President Obama in a similar circumstance was Louisiana Gov. Bobby Jindal in January 2009. Jindal popped up to the camera in the vestibule of his gubernatorial mansion in Baton Rouge, manging to seem impertinent, immature and self-important all at the same time. Widely panned, he receded into a secondary role in his party's national affairs. The following year, 2010, the party turned to another — this one just elected in Virginia two months earlier. A good-looking and youthful conservative, Bob McDonnell had people talking about his future place on a national ticket. Five years later, his one term as governor finished, McDonnell is appealing his recent conviction on charges of corruption in office (and his sentence of two years in federal prison). Things got better for the SOTU responders in 2011, when the GOP turned to Rep. Paul Ryan of Wisconsin. Ryan was just taking over as the chairman of the House Budget Committee following the party's smashing victories in November 2010. Ryan gave a well-received speech about budget priorities. Not long after, he brought forth a budget that slashed federal programs for lower-income groups and emphasized tax cuts and other incentives for investment. Lavishly praised by fiscal and social conservatives, it has never been approved by the Senate and has provided plentiful ammunition for Democratic attack ads. But Ryan himself went on to the 2012 vice presidential nomination and is now chairman of the Ways and Means Committee. While he took himself out of the 2016 presidential sweepstakes, he is barely in his mid-40s and bids fair to be part of the national conversation for a long time. 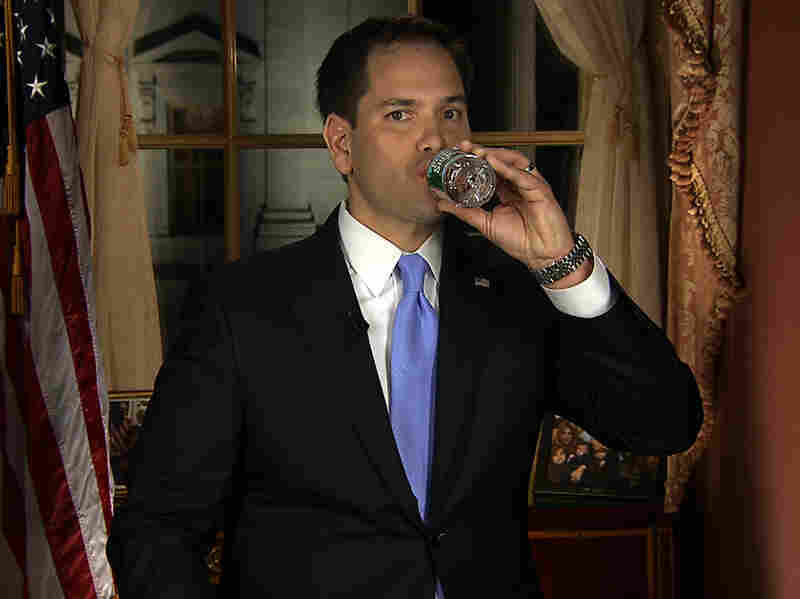 In this screen grab, Florida Sen. Marco Rubio takes a sip of water during his Republican response to President Obama's State of the Union in 2013. Since Ryan, those privileged to give the SOTU response have not reaped a commensurate benefit. Indiana Gov. Mitch Daniels got the job in 2012, but only after he had already decided not to run for president that year. He has since left politics altogether. In 2013, the big responsibility fell to freshman Sen. Marco Rubio, the son of Cuban immigrants who had cut a swath through Florida politics. Rubio was able to do his response in both English and Spanish but was ill at ease, swigging water from a plastic bottle as he faced the camera. Rubio was soon enmeshed in the political crossfire over immigration, and he is no longer even the strongest presidential prospect in his home state (a distinction that now goes to former Gov. Jeb Bush). Hats off to Rep. Cathy McMorris Rodgers, the No. 4 Republican in the House and the highest-ranking woman in her party in Congress. Her speech following the State of the Union in 2014 was a model of personal appeal and modest policy pronouncements. It did her considerable personal good while doing her party no harm. This year, Ernst might well aspire to have the scoreboard read the same after her SOTU response.